The Bing Overseas Studies Program’s (BOSP) newly reintroduced Stanford Overseas Seminars are here to stay, according to Naoko Sakata, BOSP external programs coordinator. “We are scheduled to offer seminars for foreseeable future years,” Sakata wrote in an email to The Daily. According to Sakata, funding has been approved for the eight 2013 summer seminars in Vienna, Rio de Janeiro, Costa Rica, Israel, India, the Republic of Palau, Madagascar and Wales. BOSP offered three more seminars than last year and only two fewer than the peak number of ten seminars in years previous to the 2010-2011 hiatus. A total of 460 students applied for 75 available spots last year, according to BOSP Enrollment Services Coordinator Alyssa Geiger. This year 120 spots are available. The Overseas Seminars, three-week two-unit courses open to undergraduates, were put on hold in 2010 due to budgets cuts. Following a two-year hiatus, five seminars were held in India, Turkey, Tanzania, the Netherlands and Brazil last summer. Each seminar is limited to 12 to 15 students and costs $600, covering lodging, meals and course activities but not transportation and incidental costs. 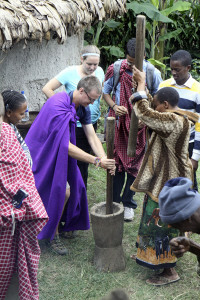 Robert Siegel, associate professor of microbiology and immunology, who led this year’s Issues of Development in Northern Tanzania seminar, was disappointed when the program was cancelled three years ago but expected the cut. Siegel led two trips prior to the program’s hiatus–the same one to Tanzania in 2006 and a trip to England to follow the path of Darwin’s life. BOSP offers the seminars to provide a study-abroad opportunity for students who are not necessarily able to fit a full quarter-length overseas trip into their undergraduate schedule, according to Sakata. “Overseas Seminars are specifically designed to integrate course content and location,” she said. Thomas Hansen, an anthropology professor who led his first Overseas Seminar this year in India this year, echoed this sentiment. “The place you go is not just the site where you take your courses–the course is about that place,” Hansen said. “You get to be completely immersed in the place and its culture for three weeks, and have a hands-on experience with the subject that you are exploring,” Le added. Each year, the selection of seminars covers a wide variety of topics. Their unifying feature is the level of engagement they draw from their participants, Siegel said. Hansen will be offering this same seminar again in the summer of 2013 and hopes it becomes a regular class in the Bing program. The application deadline for summer 2013 Overseas Seminars is Oct. 21, a full quarter earlier than last year’s Jan. 29 deadline. Selection results will be released on Nov. 16.